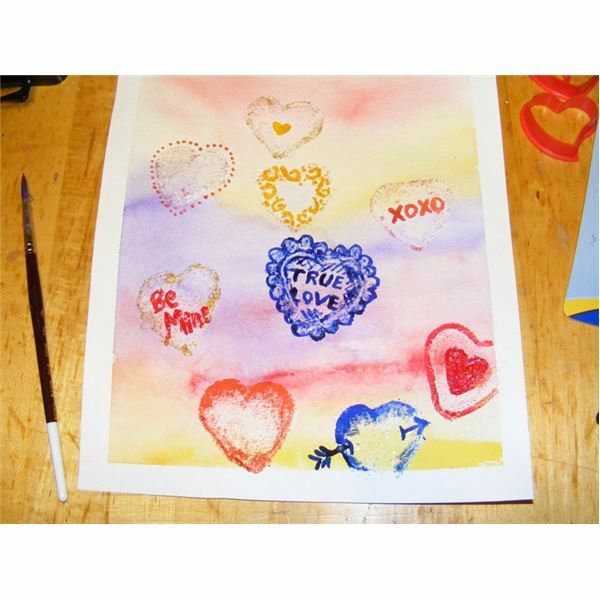 This lesson will teach how to create stamped hearts and heart imprints on a watercolored background. They can be displayed in a heart shape. It is for students in grades 1 to 8 and can be adapted to the older grades by creating more intricate hearts and messages. It will also teach how to create a bouquet of hearts to stand out from the background. 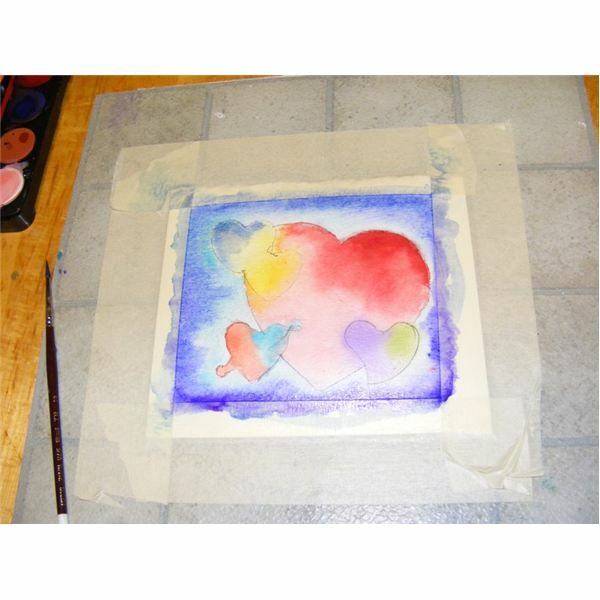 Tape the watercolor paper around all 4 sides to a board or old tile to paint on. Wet the entire paper with water. Paint a warm color such as red, or pink across the top 1/3 of the painting for the background. Add a second color such as yellow or orange touching the first color. Tip the painting to allow the colors to mix. Let the water do the work. 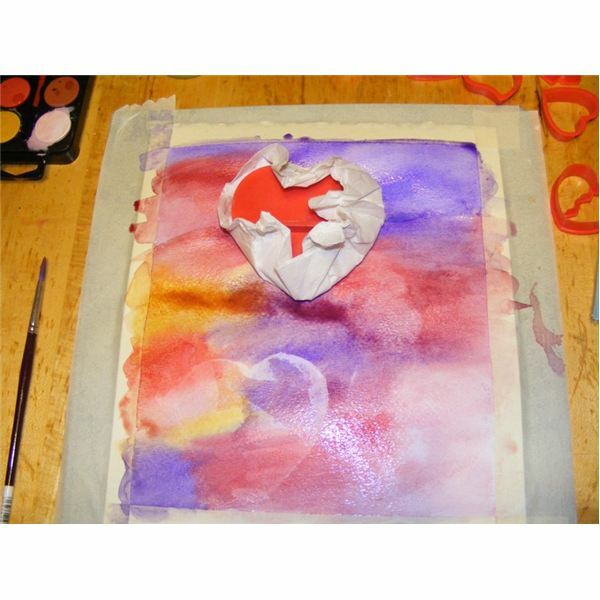 While still wet, press a heart-shaped sponge or a wooden heart-shaped cookie cutter wrapped in tissue paper, on the painting to soak up paint. Allow to dry. This creates heart imprints. 1. 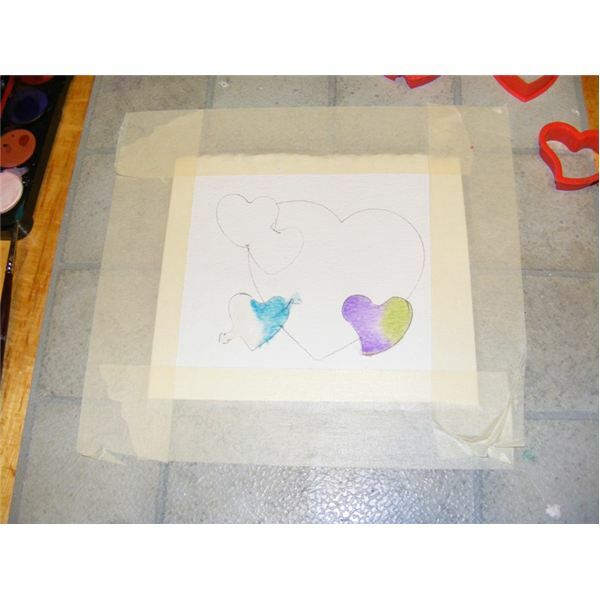 Using glitter glue or acrylic paint, outline the shapes created on the background and paint a message in the heart shapes. Use smaller hearts for this. 2. When it's dry, you can also stamp the painting with white or red acrylic paint that has been painted on to a rubber stamp. The stamp can be simple or a purchased rubber craft stamp. Allow to dry. 3. 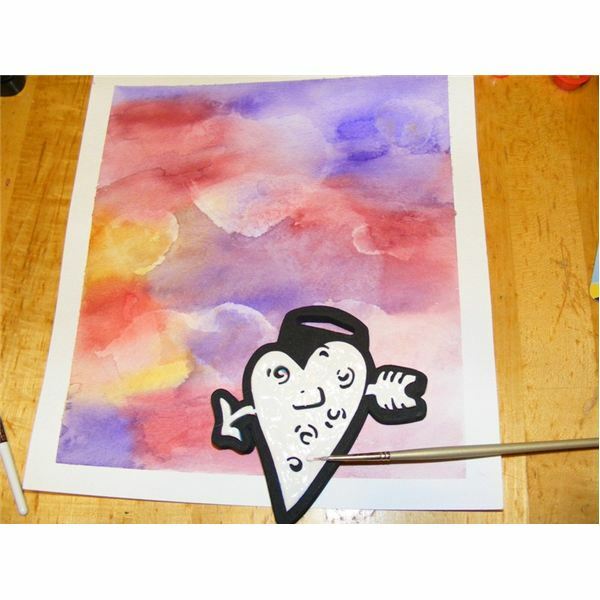 When it's dry, you can use the paper to cut out large heart shapes to fold and paint a message onto to create watercolor valentines. Give the students several ideas to choose from. Mount on a larger white manilla tag paper for a solid folding card. 4. 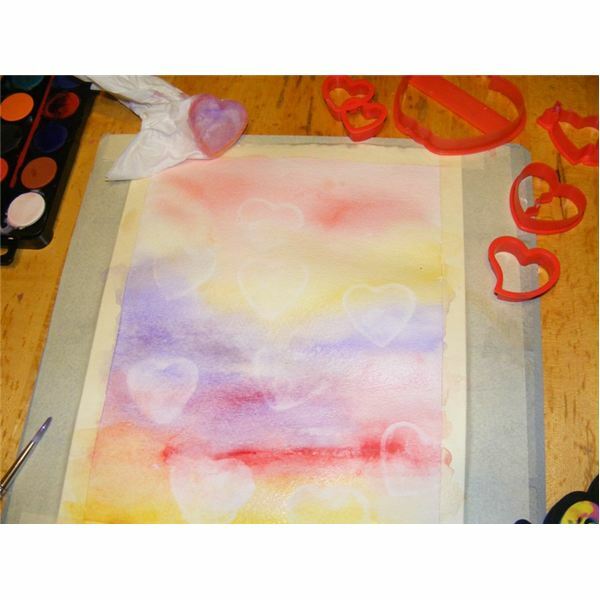 You can also cut out smaller hearts to paste onto another watercolor background. To create a bouquet of hearts for Valentine's Day, begin by taping a 4 x 6 watercolor paper to a tile around all 4 sides of the paper. 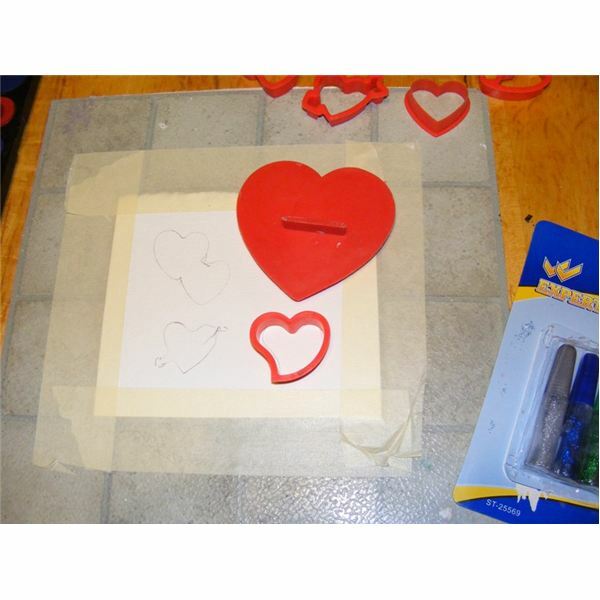 Using heart-shaped cookie cutters or stencils, draw several hearts lightly on the paper with a pencil. Hearts can overlap and be different sizes to create the bouquet. Using the brush wet one heart with clean water. Paint one color (red) on one side of a heart. Paint a second color (yellow) touching the first color. Tip the painting so the colors mix. Let the water do the work. Following the same procedure, paint 2 other colors (lime green and purple, for example) in another heart. Repeat until all hearts are filled with paint. To paint the background, wet the background with clean water. 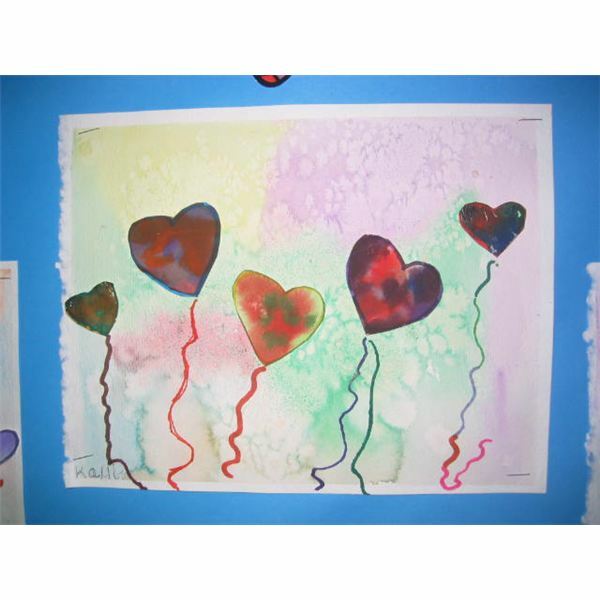 Then using a blue, purple or yellow color, paint in the background so that the hearts stand out against it. Allow to dry. When dry, outline the hearts with black or purple sharpie marker. This same procedure can be found for painting the leaves in the Easy Watercolors for Fall Project. Students should be reminded to wet all surfaces before painting their watercolor projects. Allow one color to touch another so that the water mixes them, rather than trying to brush one color overtop of the other. Let the water do the work. If using a cookie cutter, wrap in thick paper towel or tissue to soak up an outline of a heart or the entire heart shape. Do this when the painting is wet. 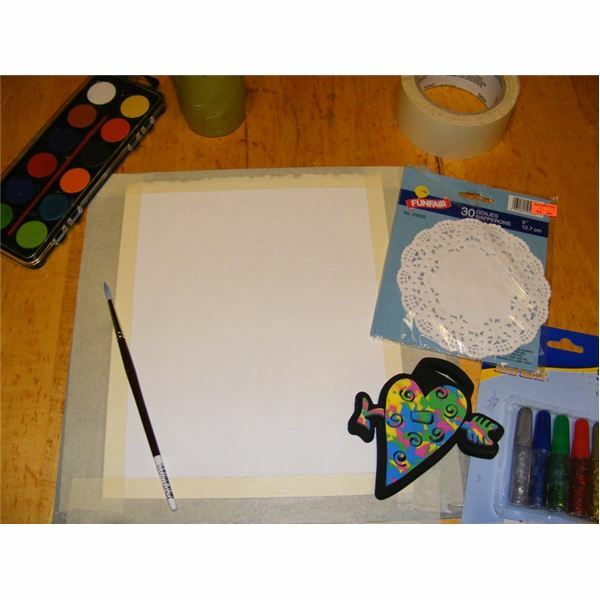 Have a stencil for students to trace for cutting out heart shapes or painting in heart shapes. 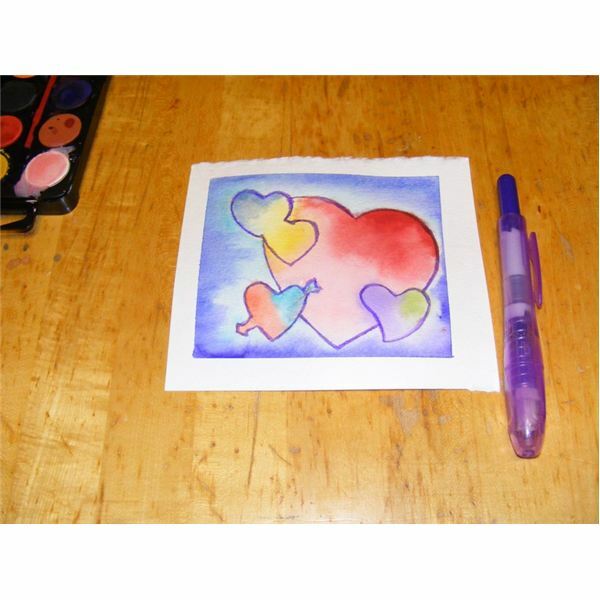 Students will want to create the perfect heart for their watercolor Valentine's project. When using a sponge or rubber stamp, refresh the paint often by painting the white paint on the stamp. 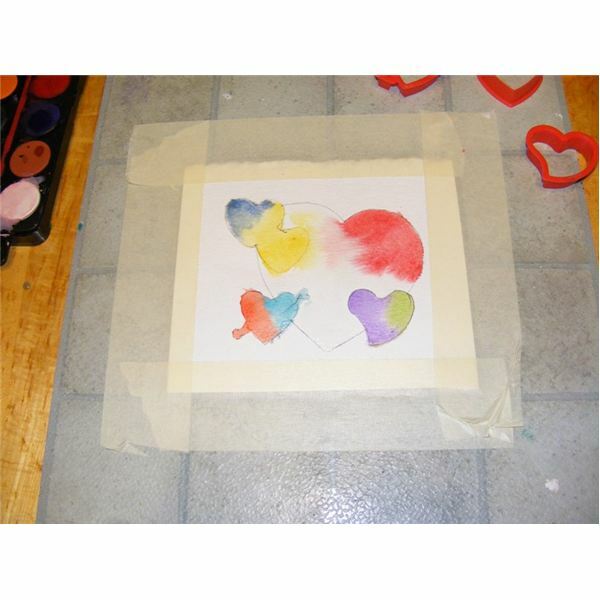 A good sponge to use for this watercolor painting project is a compressed sponge from a craft store that can be easily cut into a heat shape. Use this watercolor painting lesson to teach about symmetry. Show how folding the paper in half will make it easy to make 1 cut but produce a symmetrical image. 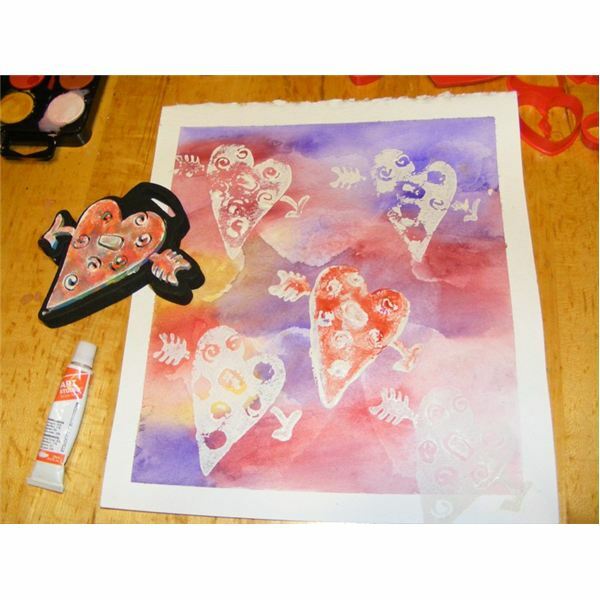 Use various sized hearts to stamp in a pattern on the paper. Teach about patterns with the students by alternating shapes or by alternating red and white colors on the painting. 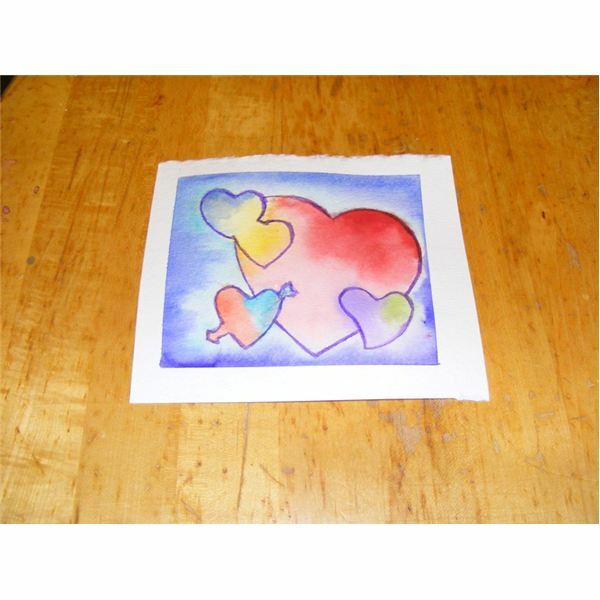 Teach about symbols of love and expressions to use in Valentines Day messages. Provide examples such as smileys and emoticons used in email messages. Examples such as " B mine" or " I heart U" can be used. 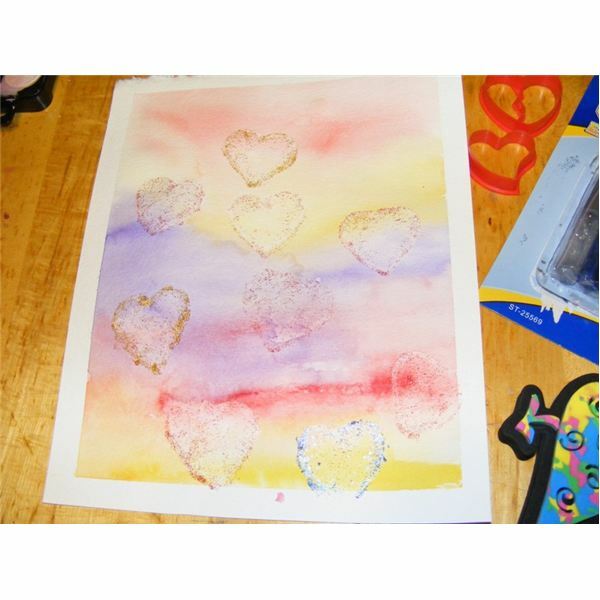 Students can practice handwriting in glitter glue to create messages or love letters for designs on their hearts. Students will find this a fun and enjoyable watercolor painting project that can be done in various ways. 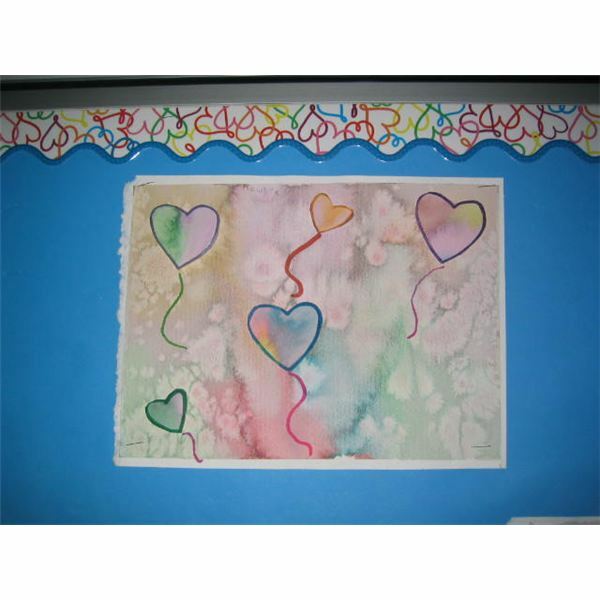 Backgrounds with heart imprints gives students many Valentines to fill in with painted messages and is suitable for older grades. 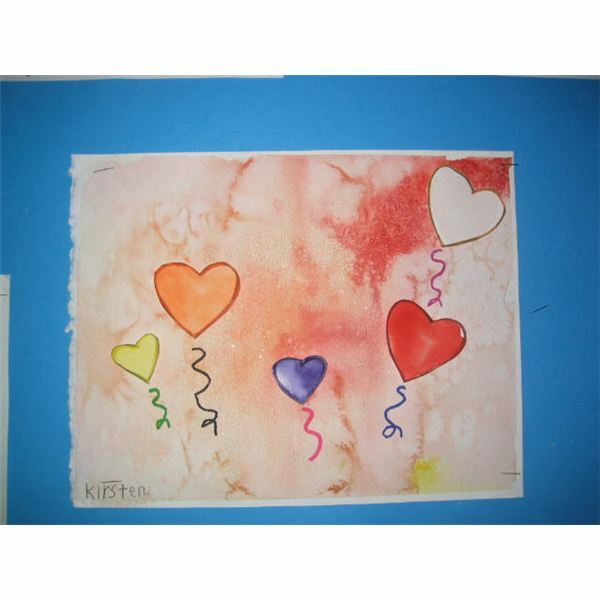 Stamped hearts are easy and fun to do for the primary grades. Students will enjoy mixing the colors to get light red and pink hearts. Gold glitter can be added to enhand the designs for a bouquet of hearts. These articles will display watercolor techniques for creating winter landscapes, frosted windows, polar bears, snowflakes and Valentine’s Day paintings. 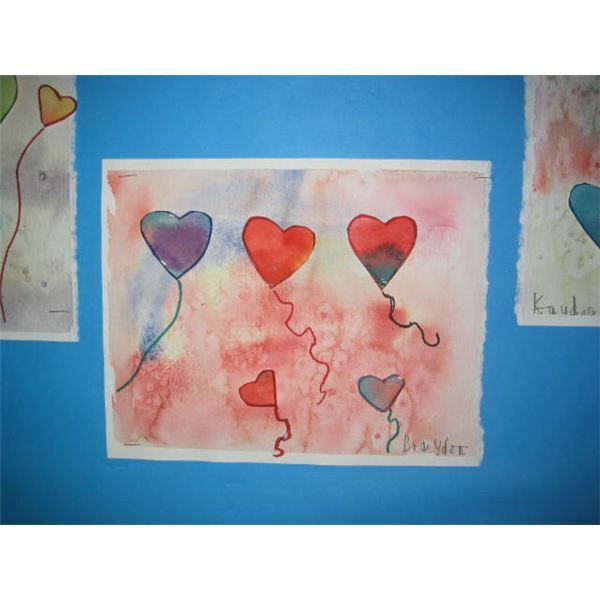 The watercolor painting lessons are easy to follow and can be adapted for elementary art lessons, grades 1 through 8.